Innovation is premised on experimentation, or “the action or process of trying out new ideas, methods, or activities.” And yet, this word—experimentation—is seldom deemed appropriate for or associated with what is currently happening in humanitarian innovation programmes all over the world, from Kathmandu to Amman, and South Central Somalia to San Francisco. It is vital to keep in mind and manage the experimental nature that characterises humanitarian innovation efforts (Sandvik, Jacobsen and McDonald, 2017). In order to achieve this, any programme – whether it’s business as usual or the development of a new innovation – must adhere to the principles and standards that govern humanitarian action. This section will outline the core humanitarian principles and standards drawing from The Core Humanitarian Standard on Quality and Accountability (CHS), Sphere Standards, and ICRC’s Code of Conduct. These are the main ‘rules’ that have been agreed across the humanitarian sector, and that are fundamental to consider when innovating, and experimenting in any humanitarian situation. The core humanitarian principles of humanity, impartiality, independence and neutrality are based on International Humanitarian Law (such as the Fourth Geneva Convention) and underpin the definition of what constitutes a ‘humanitarian’ response (OCHA, 2012). Impartiality: Humanitarian action must be carried out on the basis of need alone, giving priority to the most urgent cases of distress and making no adverse distinction on the basis of nationality, race, gender, religious belief, class or political opinion. These principles are the foundation for integrated and widely accepted codes of conduct, commitments and core standards, including the ICRC Code of Conduct, the Humanitarian Charter and Minimum Standards in Humanitarian Response, and the Core Humanitarian Standard (CHS) on Quality and Accountability. The purpose of the Code of Conduct is to outline a set of behavioural standards that humanitarian agencies can sign up to. They are the next step for translating humanitarian principles into humanitarian practice, which the Sphere Standards and CHS further build upon. Aid is given regardless of race, creed or nationality of the recipients, and without adverse distinction of any kind. Aid priorities are calculated on the basis of need alone. Sphere is a voluntary initiative that brings a wide range of humanitarian agencies together around a common aim – to improve the quality of humanitarian assistance and the accountability of humanitarian actors to their constituents, donors and crisis-affected populations. 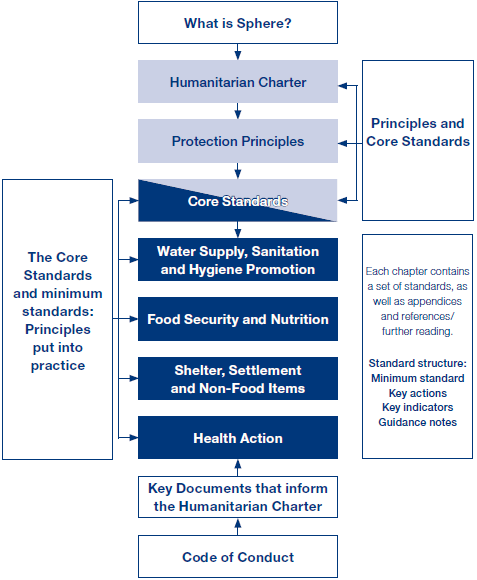 The Sphere Handbook, Humanitarian Charter and Minimum Standards in Humanitarian Response, is one of the most widely known and internationally recognised sets of common principles and universal minimum standards in life-saving areas of humanitarian response. Protection Principle 1: Avoid exposing people to further harm as a result of your actions. Protection Principle 2: Ensure people’s access to impartial assistance – in proportion to need and without discrimination. Protection Principle 3: Protect people from physical and psychological harm arising from violence and coercion. Protection Principle 4: Assist people to claim their rights, access available remedies and recover from the effects of violence and other abuses. People’s capacity and strategies to survive with dignity are integral to the design and approach of humanitarian response. Humanitarian response is planned and implemented in coordination with the relevant authorities, humanitarian agencies and civil society organisations engaged in impartial humanitarian action, working together for maximum efficiency, coverage and effectiveness. The priority needs of the disaster-affected population are identified through a systematic assessment of the context, risks to ‘life with dignity’, and the capacity of the affected people and relevant authorities to respond. The humanitarian response meets the assessed needs of the disaster-affected population in relation to context, the risks faced and the capacity of the affected people and state to cope and recover. The performance of humanitarian agencies is continually examined and communicated to stakeholders; projects are adapted in response to performance. Humanitarian agencies provide appropriate management, supervisory and psychosocial support, enabling aid workers to have the knowledge, skills, behaviour and attitudes to plan and implement an effective humanitarian response with humanity and respect. The CHS applies to organisations and individuals that: (1) deliver direct assistance to communities and people affected by crisis; and those who (2) provide financial, material, or technical support to other organisations but do not directly take part in providing assistance.